CS Joseph Nkaiserry is Dead, his wife collapsed and admitted at Karen Hospital after she received the news. - Bana Kenya News, Real African Network Tubanane. Home featured CS Joseph Nkaiserry is Dead, his wife collapsed and admitted at Karen Hospital after she received the news. CS Joseph Nkaiserry is Dead, his wife collapsed and admitted at Karen Hospital after she received the news. The Interior Cabinet Secretary Joseph Ole Nkaiserry is dead. The CS dies after a series of prominent people died recently in mysterious circumstances. The CS died at Karen Hospital, a few hours after he was admitted for a check-up. Chief of Staff and Head of the Public Service Joseph Kinyua confirmed the news in a statement early on Saturday in his office. "The country to be updated as more information becomes available," Mr. Kinyua said. The Statehouse spokesperson Manoah Espisu said the president and his family and the government at large were shocked for the sudden death of the colleague who had a tough stand. 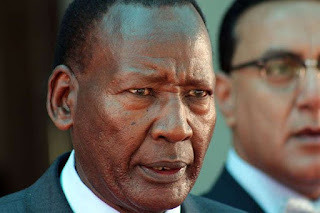 Sources close to Mr. Nkaissery said he went to Karen Hospital at around 3 pm after leaving Uhuru Park where he accompanied President Uhuru Kenyatta at a prayer event. "He actually looked okay but he said he needed to go to the hospital as he was not feeling well," the source said. The Sudden death has left his wife also admitted at Karen Hospital. She fainted when the news of her husband death reached this morning.